Where Has All the (Sea Trash) Plastic Gone? Microplastics embed into deep-sea sediment—and there's a lot more than thought. 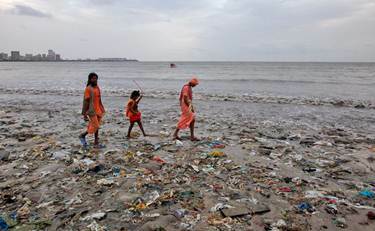 A family walks on a garbage-strewn beach in Mumbai in June 2012. According to a new report, a huge amount of microplastic has accumulated at the bottom of the sea. When Spanish scientist Andres Cozar Cabanas compiled the first ever global map of ocean trash last July, he inadvertently uncovered a mystery. Much of the plastic he expected to find bobbing in the oceans, given a quadrupling of plastic production in recent years, had "disappeared." In a new study, published this week by the journal Royal Society Open Science, a British scientist reports the riddle of the "missing" plastic as solved: It sits in deep waters, broken down into tiny fibers and embedded in the sediment of the most remote places on Earth. "The deep-sea floor appears to provide an answer to the question, where is all the plastic?" says Richard Thompson, a marine biologist at Plymouth University in the U.K. In the study, Thompson and his team concluded that every square kilometer of deep ocean contains about four billion plastic fibers—most are two to three centimeters in length and as thin as a human hair. The fibers are four times more abundant in the deep sea than in surface and coastal waters. Chelsea Rochman, a marine ecologist at the University of California, Davis, who studies the effects of plastic retrieved from the stomachs of fish and shellfish, was not surprised that Thompson's team found the "missing" plastic in the deep sea. "Every time they look somewhere for plastic debris, they find it. What is surprising is that what they are finding is that most of this is fibers." Kara Lavender Law, an oceanographer at the Sea Education Association in Woods Hole, Massachusetts, was also surprised that the fibers were so widespread. "The more we look, the more we find," she says. "I was surprised that they found microfibers in every core of all the regions sampled." Thompson first called attention to ocean debris in 2004, when he concluded that most marine debris was plastic, overturning the general view that ocean trash consisted of wood, cloth, fishing gear, and other discarded items. "Our results show evidence for a large and hitherto unknown repository of microplastics," Thompson wrote. "The prevalence of microfibers in all sediment cores and on all coral colonies examined suggests this contaminant is ubiquitous in the deep sea." Lucy Woodall, a zoologist at the Natural History Museum in London and one of the study's authors, noted that the challenge for marine scientists has been to document the eventual resting place for ocean plastic. "It is alarming to find such high levels of contamination, especially when the full effect of plastics on the delicate balance of deep sea ecosystems is unknown," she says. Thompson's team analyzed samples collected from 16 sites during seven research cruises between September 2001 and August 2012 in the Mediterranean Sea and in the southwest Indian and northeast Atlantic Oceans—a huge expanse that included subtropical to subpolar seas. The samples were collected by a remotely operated vehicle in submarine canyons, continental slopes, and basins. The scientists wore natural-fiber clothing to avoid contaminating their samples. Samples collected from four locations in the Indian Ocean showed that microfibers had accumulated on the surface of coral. Most of the fibers were blue, black, green, or red, although Thompson noted that his team also collected pink, purple, and turquoise fibers. Surprisingly, more than half of the fibers collected contained rayon, a man-made synthetic polymer that was more than twice as abundant as polyester, the next most prevalent fiber. How Dust Might Make Drought Worse (or a Bit Better) in California | Climate Change Leader. Where Has All the (Sea Trash) Plastic Gone?